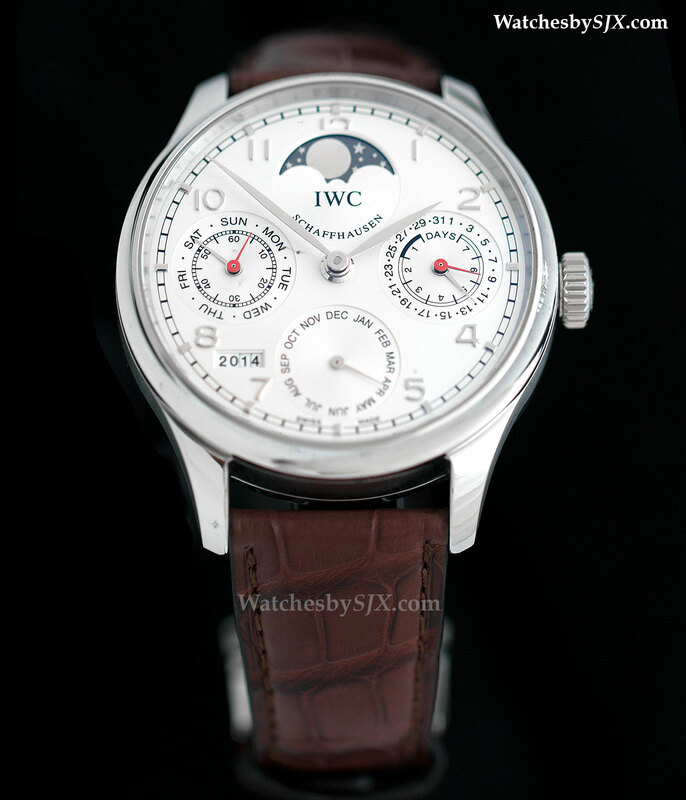 Till this year IWC only made the Portuguese Perpetual Calendar in gold or platinum. But earlier this year a limited edition steel version was announced, making the Portuguese perpetual available at a significantly lower price point than before. 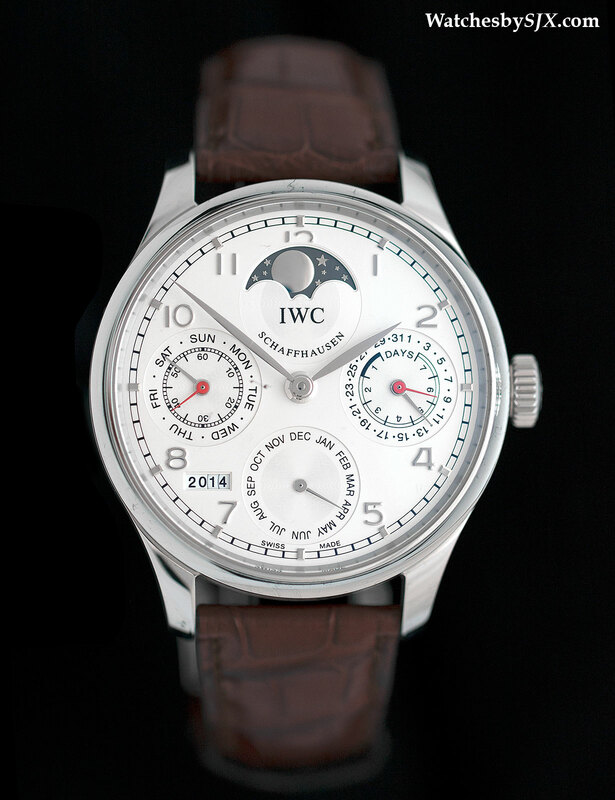 The Portuguese perpetual in steel is a variant of the reference 5023, the Portuguese perpetual with the single moon display (the other reference 5032 has a double hemisphere moon phase). Being steel it is also tangibly lighter than its precious metal siblings, though at 44.2 mm in diameter it is large enough to have heft. Mechanically it is identical to the precious metal versions, with the most obvious aesthetic difference being the red hands for the sub-dials, for the power reserve indicator and seconds. 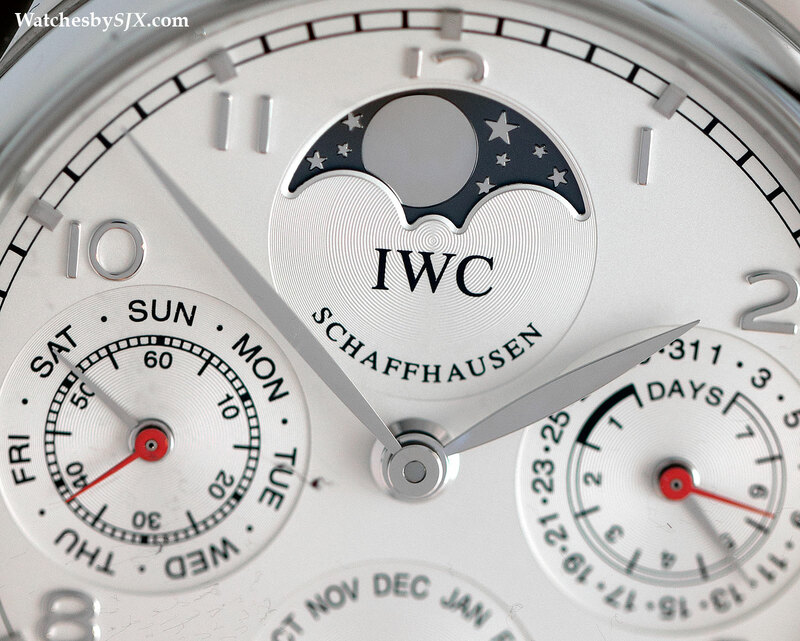 Aside from the red hands the aesthetic is nearly monochromatic, a pale silver dial with a silver on grey moon phase disc. While the aesthetic is not especially outstanding, the view from the back is compelling. 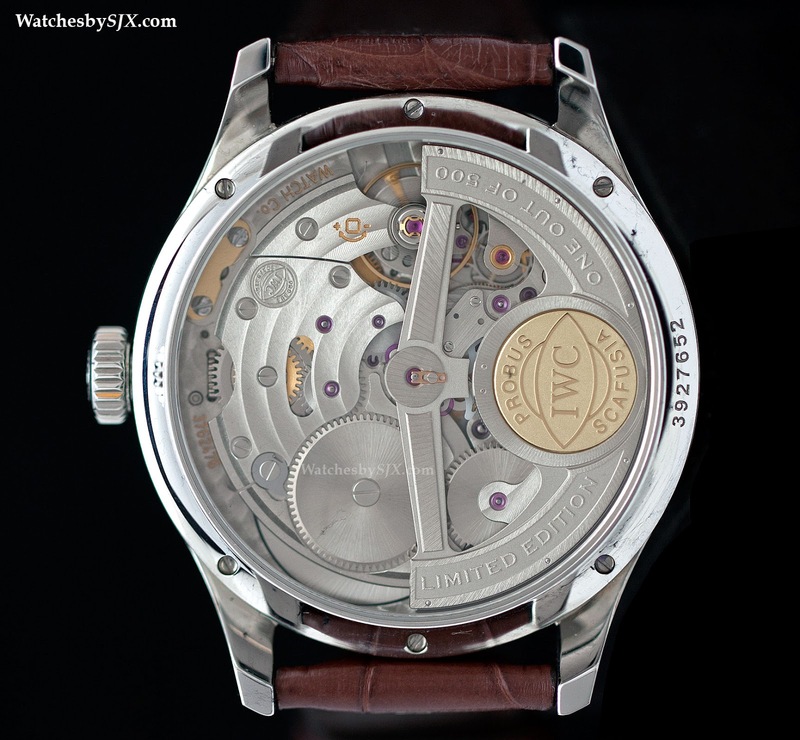 Inside is the IWC calibre 51613, a version of the calibre 5000 that is equipped with IWC’s trademark perpetual calendar mechanism, developed by Kurt Klaus and team, which made its debut inside the Da Vinci in 1985, the first perpetual calendar with a four digit year display. Its most substantial accomplishment was to have all the calendar functions controlled from the crown, which could only advance them linearly. That made setting easy, though if the display is advanced past the correct date one has to wait until the calendar catches up. 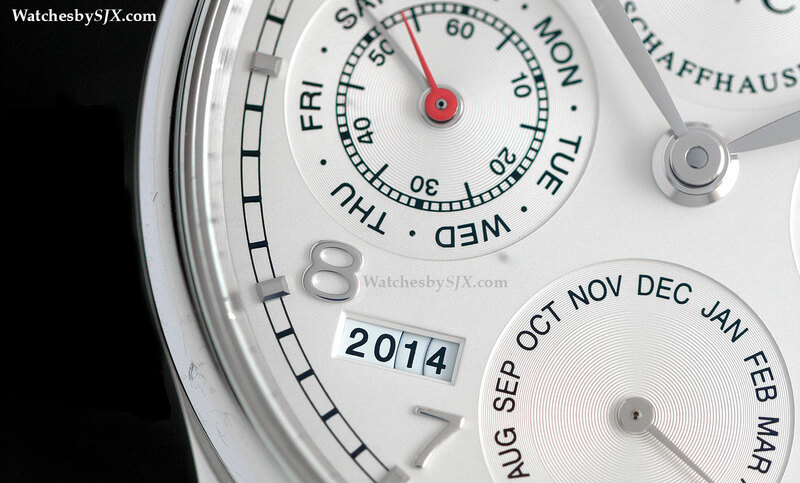 This is an extraordinarily big, self-winding movement with a seven day power reserve. Well engineered, perhaps over engineered, the calibre 5000 is dominated by the massive rotor. Another notable feature is the relatively large, free sprung balance wheel. A less obvious but telling detail are the two white ceramic pawls for the Pellaton winding system. 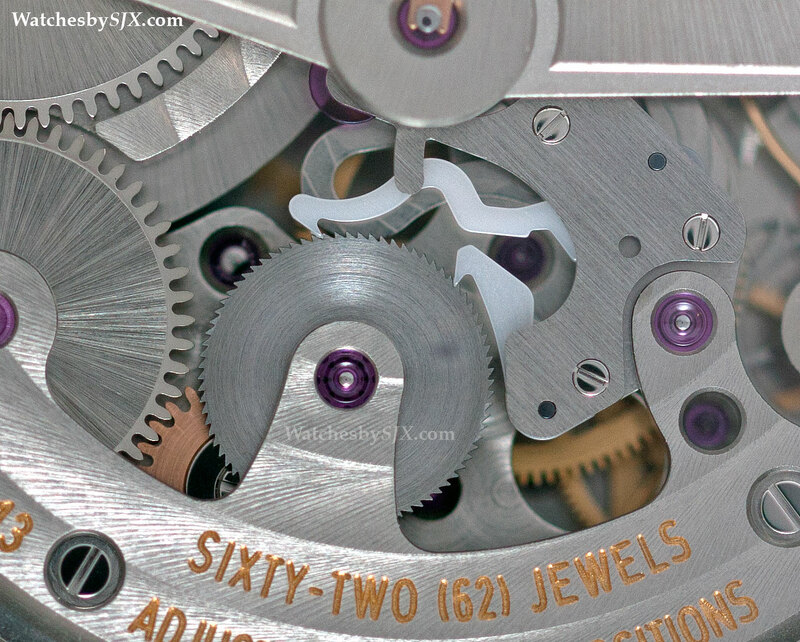 A bidirectional winding mechanism invented by Albert Pellaton, a talented watchmaker who used to work at IWC, the Pellaton winding system uses two pawls to wind the barrel in both directions. Because they suffer significant wear and tear over the life of the movement, substituting the conventional metal alloy pawls with ceramic replacements drastically extends their lifespan. 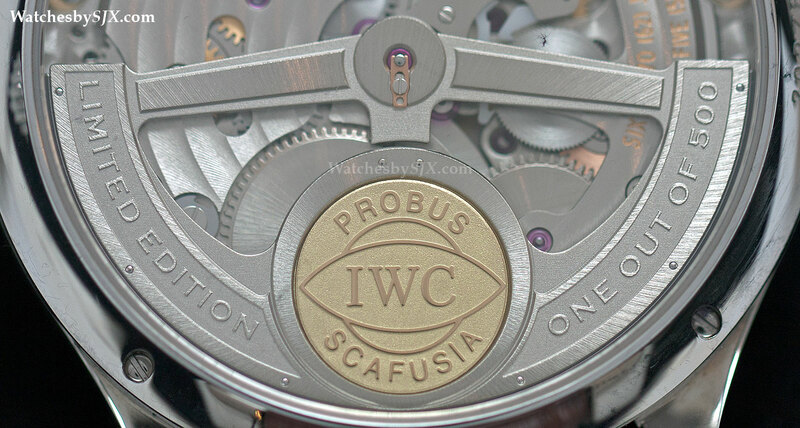 This is just one of the numerous upgrades and changes IWC has made to the calibre 5000 since its introduction 14 years ago, to make it more reliable, precise and also more cost efficient to produce. Limited to 500 pieces available only at IWC boutiques, the Portuguese perpetual in steel is priced at US$28,700 or 39,500 Singapore dollars. The gold version costs some 50% extra, making this a comparatively compelling value.